Over the course of time a number of artists have been moved to record Blue Row for posterity, Click on the thumbnails to see a larger image. The first of these pictures, the photograph, is part of a series of photographs taken by Mr. Frank Packer, photographer, of Chipping Norton, early in the twentieth century, we believe round about 1910 – so almost a hundred years ago. Many of his photographs were given after his death to the Centre for Oxfordshire Studies. To find other photographs of Swerford, go into the Oxfordshire County Council web site and look at the Heritage Search with a search entry such as ‘Packer Swerford’. The second, Carolling at Blue Row, is by Elizabeth Borghero during her naïve period, and shows an imaginary carol singing scene in the garden of number 3. It was painted in 1983 as oils on wood, 28.5cms x 17cms. 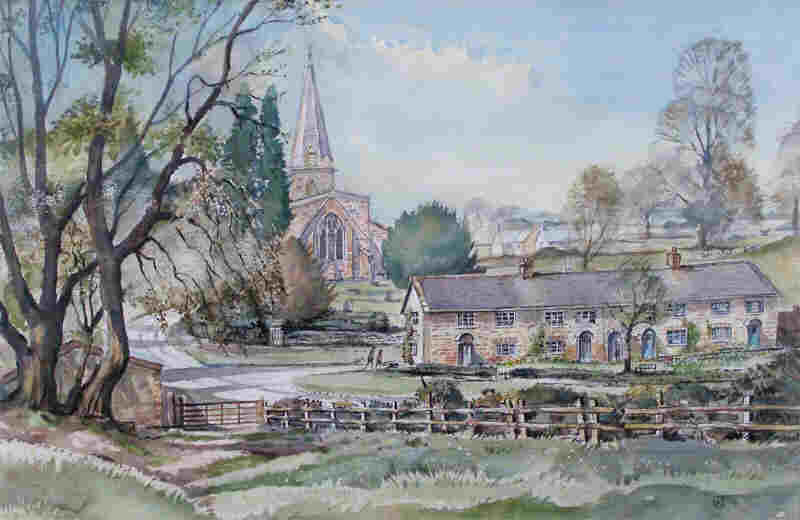 The third was painted by Ken Jones, a local artist, in 1991, as a watercolour, 34.5cms x 52cms. He set up his easel on the hillside above, and was shocked by curious cows licking his ear. He jumped up in alarm, spilling his water pot – there are discernible splash marks visible on the original painting! The small figures, a mother and child, walking down the lane beside the cottages are recognisable as local residents with their dog, Meg.